It's that time of year. If you've followed us over the past couple years you'll know we like to find some way to repay our readers with our annual event. 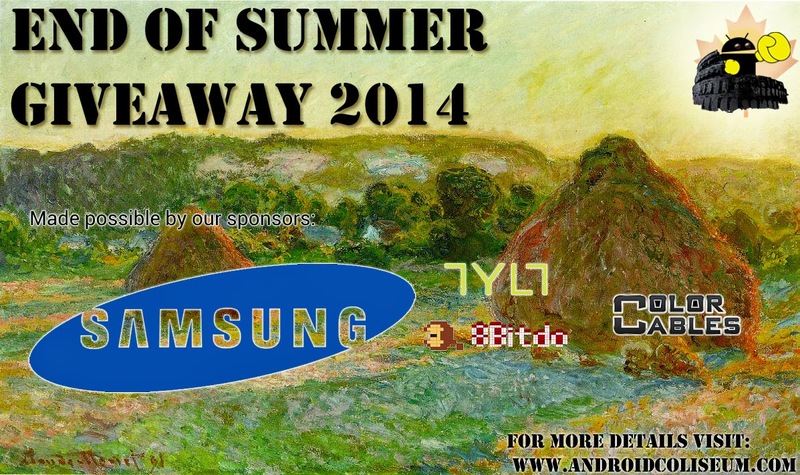 This is our second summer here at +Android Coliseum and I think you'll enjoy it. Samsung Galaxy Tab 4 White 10.1"
Thank you to our sponsors for supplying us with these items to give away. And thank YOU our readers for continuing to follow us. Without you we wouldn't be able to get these items to give out. Simply fill out this form and we'll have your name in the draw. Of course we have to have something in there to make it not only fun, but to help promote us as well... So we ask that you follow us (on G+, Twitter, or FB) to be included in the giveaway and share this link. Giveaway runs until September 3rd as we'll announce the winners during the hangout show (~ 10PM EDT). Anybody who writes for Android Coliseum and their immediate families (i.e. if they live in the house with you) are ineligible... just looks bad. When you're selected, you'll be given 24 hours to respond, or we'll have to redraw. If we don't get many applicants (minimum 20 different folk) we'll hold on to the prizes for a later date and another giveaway down the road. All entries will be sorted according to their time of entry, and then a random number generator will pick the position of the winner for prize #1. If that person has any other entries, they will then be removed as we then draw for prize #2, and so on. Facebook, Twitter and Google+ are in no way associated with this giveaway. By providing your information in this form, you are providing your information to me and me alone. I do not share or sell information and will use any information only for the purpose of contacting the winner.